There are few household chores that I really hate. The one exception is ironing. My husband has to wear dress shirts to work everyday which means that every Sunday I spend my evening ironing. I don't mind washing dishes, laundry or any other household duties. However, there is something mind numbingly boring about ironing. I just can't enjoy it, even after 10 years of marriage. Many Sundays I put off the ironing forcing myself to have to wake up at 5:30 Monday morning to iron shirts for the week. It's a little better if I do the ironing while watching TV, but only slightly. I try to treat myself to a food I like after finishing my ironing for the week. It makes the whole experience seem better. Tonight I tried a new recipe for Apple Sage Cake from Martha Stewart Living. This recipe has 9 ingredients. It takes 45 minutes of total time, 15 minutes of which is active and makes 12 servings. I did make a few changes to the original recipe. First since I eat gluten free I replaced the all purpose flour with gluten free. I mixed the dry and wet ingredients separately and then combined them. The recipes does it all in one bowl, but I prefer doing them one at a time. The edges and the top of the cake brown quickly so if they start to over-brown put a piece of foil over the top. The granny smith apples in this recipe work really well. The sage is mild and blends nicely with the apples. This cake would be perfect with a cup of tea or coffee. My youngest didn't even notice that the cake had fresh herbs, so don't be intimated by using them. For the recipe go to Apple Sage Cake. I love cake recipes like this one! This sounds great. 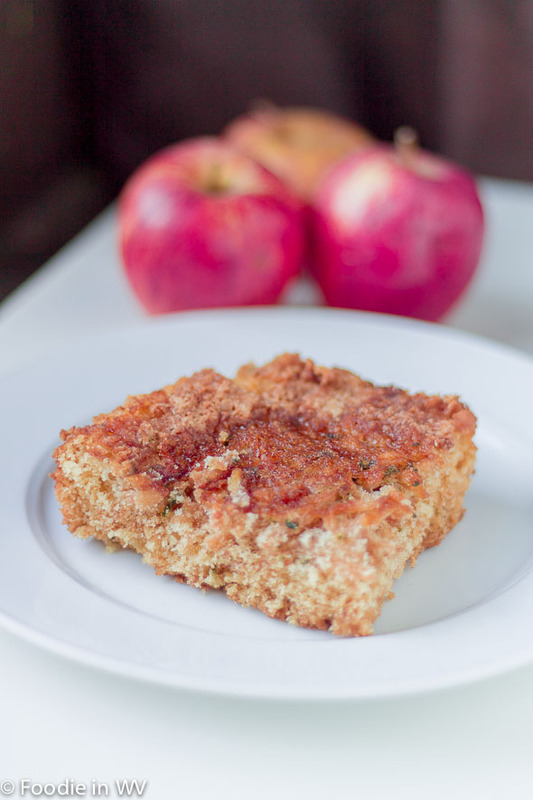 I love apple cakes and I like the idea of adding sage; it sounds really interesting and I think they would compliment each other very well. I love apple cakes too, my mom made them a lot growing up so they remind me of childhood. The sage works great with the apples! Oh you are good. My husband also has to dress up for work, but I make him iron his own stuff. My husband tried it once, it didn't end well :) He burned a hole in one of his shirts! Looks so yummy! Love apple pie and this is wonderful idea. Thanks :) I love apple pie too, but I hate making pie crust! That's a great idea to get through ironing. I hate it too. I do everything I can to keep clothes from needing to be ironed. Mmm, love the sweet and savory together. Me too, they are a great compliment to each other! I'll have to try this recipe when the apples in our orchard are ready to pick. We hate ironing too - so much that we barely ever do it! My husband only buys wrinkle free shirts for work, and whenever our clothes look wrinkly, we just spritz them to get them damp and throw them in the dryer for a few minutes. It's not perfect, but better than busting out the dreaded iron, lol. This cake sounds like an excellent reward for it though! This looks delicious! I hate to iron as well, thank goodness my husband is a master at ironing! His mama taught him well! I wish my husband had learned the skill :) Your husband sounds fabulous! I was going to suggest your husband do the ironing until I saw that he burned his shirt wheh he tried! Oh well. Love apple pie so this would work for me. Yum. Thanks for this lovely sounding recipe. Can't wait to give it a go. Ooooh yummy! I have some sage growing and I am always on the lookout for ways to use it in my cooking. I love using herbs in desserts, but haven't tried sage in any desserts yet. This looks so delicious! Well this is definitely a recipe I will try, Apple Sage Cake, this sounds very interesting and delicious. Thank you for sharing with the Clever Chicks Blog Hop this week; I hope you’ll join us again! Thanks for hosting :) If you try the recipe tell me how it turns out! Muy aromático con hierbas una genial rececta,hugs,hugs. The sage really does make for a great taste and smell :) Thanks for the comment!